The provincial cultural strategy identified the need to develop an action plan for safeguarding ICH. 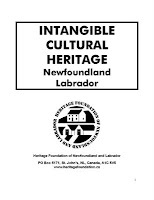 To develop such a plan, the Department of Tourism, Culture, and Recreation (TCR) appointed an ICH Working Group made up of representatives from the Museum Association of Newfoundland and Labrador, the Archives Association of Newfoundland and Labrador, Parks Canada, the Department of Tourism, Culture and Recreation, Memorial University, Torngasok, and the Heritage Foundation of Newfoundland and Labrador, The Rooms Provincial Museum. Drawing extensively on discussions during the AHI Intangible Cultural Heritage Forum, held in June 2006, the group developed a strategy. The strategy has now been formally adopted by the Heritage Foundation of Newfoundland and Labrador as the document that will guide their ongoing works to conserve ICH in the province.